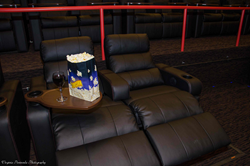 “There truly isn't a more comfortable way to enjoy a movie” stated Mike Whalen, Paragon Theaters CEO. Florida-based Paragon Entertainment Group continues to invest in its circuit to offer Paragon Theaters guests the ultimate movie-going experience. Building upon the enthusiastic reception of luxury electric recliners at two of their newer locations in Newport News, VA and Naples, FL, Paragon Theaters announced today that similar luxury electric leather recliners with footrests are being added to several locations, including Paragon Chateau (Rochester, MN), Paragon Odyssey IMAX (Burnsville, MN), Paragon Ocean Walk (Daytona Beach, FL), and Paragon Ridge (Davie, FL) with plans to have most auditoriums completed in time for AVENGERS: AGE OF ULTRON first showings on Thursday, April 30th at 8:00 pm. “These recliners will fundamentally change the movie-going experience for our guests, offering the flexibility to adjust each individual seat from upright to fully reclining with the touch of a button, thereby optimizing viewing comfort,” stated Mike Whalen, CEO of Paragon Entertainment Group. To accommodate these plush oversized recliners with footrests, auditoriums are being remodeled to double the space between rows, which adds another layer of comfort and accessibility. Paragon Odyssey IMAX guests will soon be able to purchase beer and wine at concession, in addition to the full service Mezz Bar & Lounge upstairs. Paragon Theaters will offer these great amenities and still maintain traditional theater pricing. Guests can continue to enjoy popular budget conscious promotions offered by the chain such as $6 Tuesdays and the “Paragon Free Kids Movies Summer Series” in style and comfort: select movies (rated G or PG) will be shown for free on most Tuesday, Wednesday and Thursday mornings at 10 AM in June, July, and August. Loyal guests are also rewarded with free tickets and concession through their Diamond Rewards loyalty program. To stay current on this renovation as well as upcoming promotions, Paragon encourages their guests to sign up for their weekly e-newsletter by visiting them online at http://www.paragontheaters.com and to like their Facebook page and follow them on Twitter. Paragon Theaters locations include Paragon Kentlands in Gaithersburg, MD, Paragon Village in Fredericksburg, VA, Paragon City Center in Newport News, VA, Paragon Odyssey in Burnsville, MN, Paragon Chateau in Rochester, MN, Paragon Ocean Walk in Daytona Beach, FL, Paragon Ridge in Davie, FL, and Paragon Pavilion in Naples, FL.